Temperatures have been recorded in the Tauranga area at several sites during the last 100 years, including the current Tauranga Airport site from June 1990. 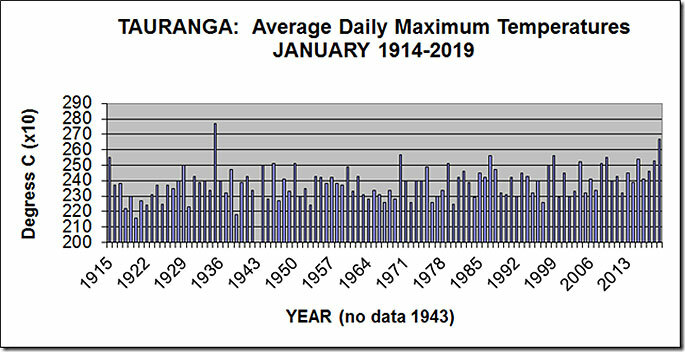 The graph above shows details of the average daily maximum temperatures (called simply ‘afternoon') for Tauranga for January from 1914-2019. The long-term average afternoon temperature in January for Tauranga is 23.8 degrees Celsius, ranging from the cool January months of 1920, with 21.6 degrees Celsius, and 1939 with 21.8 degrees Celsius, to the very warm January months of 1935, with 27.7 degrees Celsius, and January 2019 with 26.7 degrees Celsius. The average afternoon temperature in January 2019 was 26.7 degrees Celsius, the second warmest January on record. The average January afternoon temperature during the 50 years from 1963 to 2011 of 23.8 degrees Celsius, is the same average recorded in the 50 year period from 1914 to 1962. From 1914 to 2019, there have been ten January months with an average afternoon temperature of 25.3 degrees Celsius or higher, and seven January months with an average afternoon temperature of 22.5 degrees Celsius or lower. The ten warmest January months (in terms of afternoon temperatures), on record, in chronological order, are 1914, 1915, 1935, 1970, 1957, 1999, 2009, 2015, 2018, and 2019. The seven coolest January months (in terms of early morning temperatures) in order, are 1918,1920,1922,1925,1930,1939, and 1980.